PersistentTableArray and DataStore are new classes of the non-commercial .net library finaquant® protos (starting from release 1.04) that enable connection to relational databases like MySQL and Microsoft SQL in order to read/write complete tables from/to a database together with their instance information. Note that CostTblPeru2008, CostTblPeru2012 and CostTblBolivia2010 are different instances of in-memory cost tables (of type MatrixTable) with the same field structure. All you need to do is prepare an empty database and assign the connection string in order to initiate the DataStore object. All necessary tables are automatically created and updated by PersistentTableArray or DataStore operations. Note that each attribute pair (country and year) identifies a single table instance. In this example we have only two attributes, but a table row as instance key of a persistent table array can have as many attributes as you need. If a table with the same field structure and instance parameter already exists in the database it will be overwritten (unless it is locked, see DataStore methods) just like in ordinary arrays. Methods of DataStore class are responsible for all database operations for reading or writing complete tables. The WriteTableInstance() method of DataStore above writes the complete table CostTblPeru2008 into the database together with the instance information trow1 handling all required database operations behind the scenes. Persistent Table Array takes this level of abstraction and simplification one step further: All database read or write operations are executed automatically during the ordinary use of table arrays. Why are table arrays needed? Table arrays are useful in cases in which we need to make calculations with certain set of input tables to obtain the desired set of output tables. Assume you need to calculate product prices for every year with different margin and cost tables. That is, the field structure of margin and cost tables remain the same, but their entries and values may vary from year to year. Let’s add another dimension to the equation: You have different margin and cost tables for each year and country. Following code example demonstrates how you can calculate and store price tables for each country and year. You can find this demo function and more in the MS Visual Studio project file FinaquantProtosStarter (see page finaquant® protos for free download). There are lots of similar applications in real life where you need to make instance calculations with selected set of input tables. Examples include financial planning (quarterly, yearly, for each region), dealer commissions (monthly, quarterly, yearly, for each product or contract group), estimations or forecasts and so on. In most cases, the required input data are selected with ad-hoc, customized or parameterized SQL statements. Persistent Table Array provides a framework for easily reading and writing complete tables associated with a calculation instance (without needing to care for the underlying database operations) as a calculation engine based on table functions. Note that no method of the classes PersistentTableArray or DataStore will let you manipulate the entries of individual table instances. Table instances are read, written, overwritten or deleted as a whole in compliance with the philosophy of table functions. 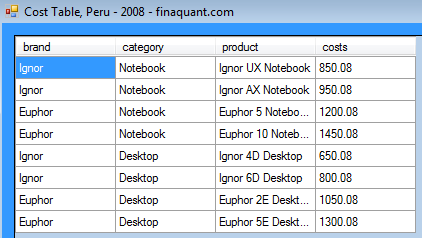 Up to release 1.03 finaquant® protos already had the features 1 and 2 as listed above. But the last feature 3 was the missing link for a full-featured table calculation engine. The new classes Persistent Table Array and DataStore with the new release 1.04 completes this missing link. Persistent Table Array is also the necessary infrastructure of Calculation Nodes and Networks because every worker ant (as calculation node) should be able to read/write tables from/to a database. This entry was posted in Calculation engine and tagged .net library, calculation engine, database. Bookmark the permalink.